The Black clown fish, Amphiprion clarkii,is also known as Yellowtail clown fish and Clarkii Clownfish. It can be found in many different color variations, but it is usually yellow and black with broad, white stripes that run vertically over the body. The Black clown fish is a so called Anemone fish and in the wild it will always try to find an anemone that can protect it from predators. Anemone fishes form symbiotic relationships with dangerous anemones and manage to live among their tentacles without being stung. The vivid coloration of the Black clown fish makes it an easy target for predatory fish, but before the predator manages to gulp down the Black clown fish it is stung by the deadly anemone tentacles. The anemone will eat the predatory fish and the Black clown fish will keep the anemone clean by eating any left over food. Wild Black clown fish is found in the Indo-West Pacific; from the Persian Gulf to the Western coast of Australia. You will also find it in the Indo-Australian archipelago, around Melanesia and Micronesia, and all the way up north to Taiwan and the southern parts of Japan. Keeping an anemone is however quite difficult and you should always research the particular anemone species carefully before you purchase it. If you like the look of the sensitive anemone but are unsure about how to keep it, you can instead purchase a high-quality replica. Your Black clown fish will appreciate a water temperature between 75 and 82 degrees F and a pH in the 8.3-8.4 range. Since the Black clown fish grows no larger than 5 inches and don’t need a big territory, a 20 gallon aquarium is large enough as long as you manage to keep the water quality up. The Black clown fish is more hostile and aggressive than most other Anemone fishes, and even when it has a host anemone it can leave it to attack another fish or catch food. When you keep the Black clown fish in an aquarium you should provide it with meaty foods, such as chopped up fish and shellfish. It will also need some vegetables and algae in its diet. 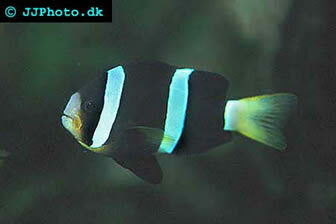 Some Black clown fish specimens will accept flake food, but they should not be kept solely on a flake diet. The Black clown fish has been successfully bred in captivity and can be raised even in commercial quantities. 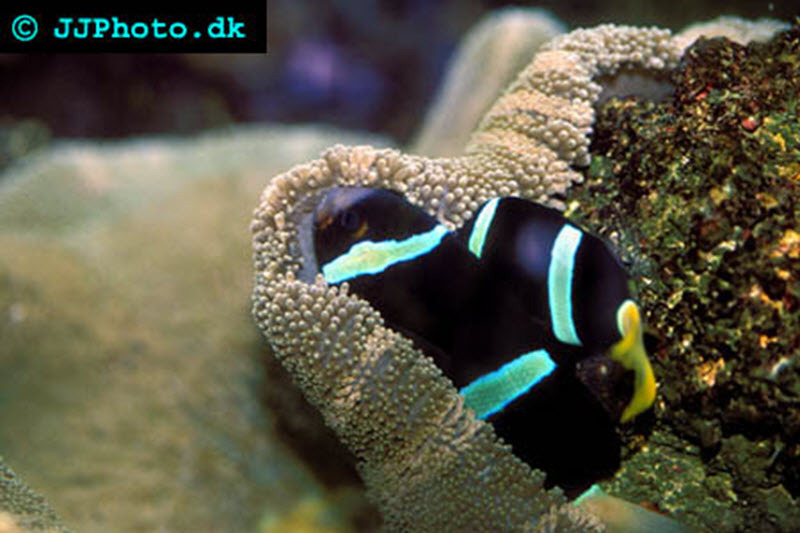 The Black clown fish is an egg laying species and they male will guard and care for eggs and fry. Try to find a captive bred specimen for your aquarium, since taking wild fish from reefs can have a negative impact. This is especially important today when the popular animated movie “Finding Nemo” have caused something of a Clown fish craze.